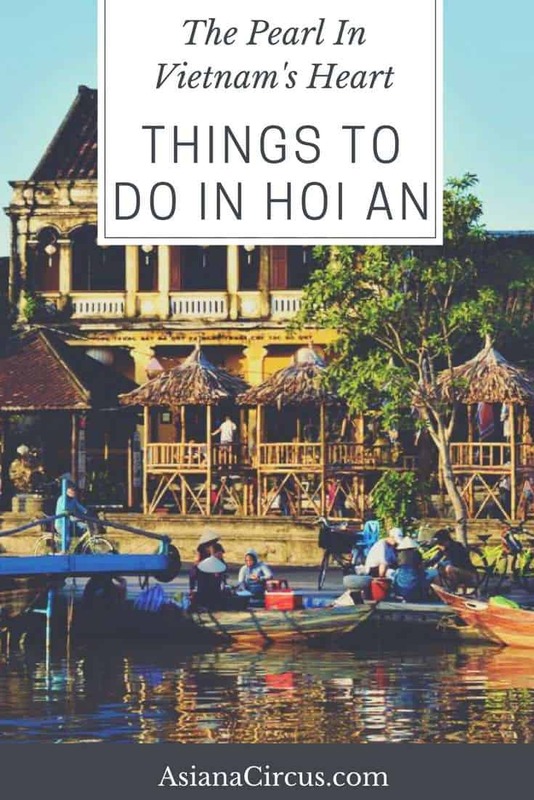 Hoi An is a must visit town when traveling in Vietnam and these are the best things to do in Hoi An. Let this magical town’s vast cultural heritage and beauty sweep you off your feet. This city is vastly different from other Vietnamese cities. Considering architecture, noise and all around vibe in the city. 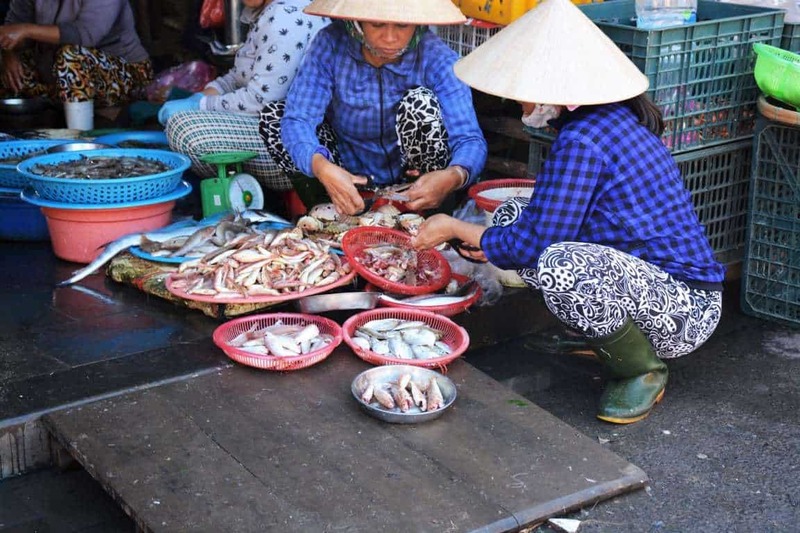 We already wrote a couple of other articles on Vietnam and about our favorite Vietnam travel destinations and favorite Vietnamese dishes that we love and think everyone should get the chance to enjoy. 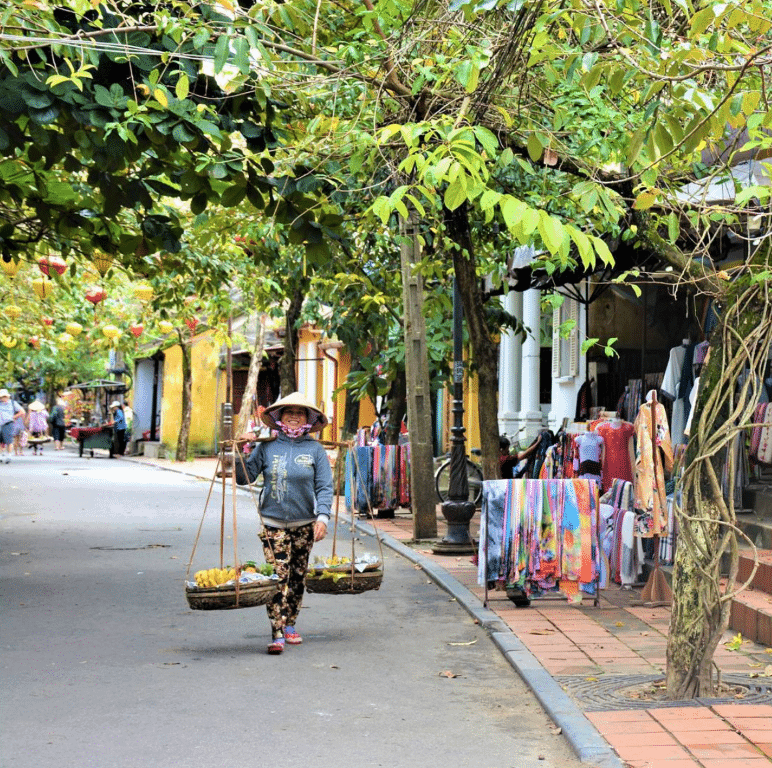 Vietnam is easily one of my favorite countries and Hoi An is one of my favorite cities. This country with its difficulties offers so much to its visitors that can’t be found anywhere else. I’ve spent over a year here, traveling back multiple times and discovering the country from north to south and I still feel I have so much more to go back for, to learn more, to explore more. This country also gave me my favorite alcoholic Butterbeer recipe! 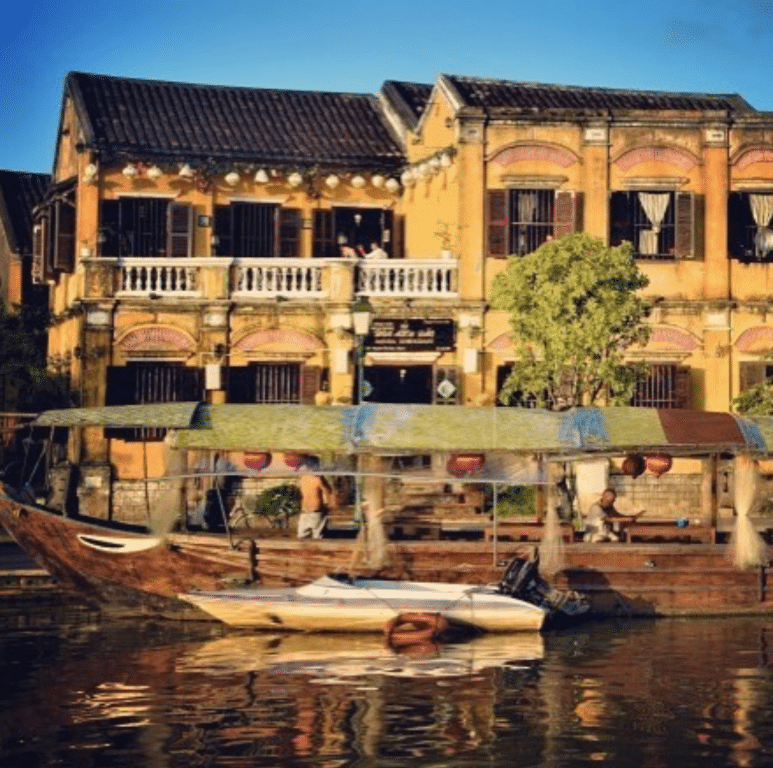 Hoi An is one of the most magical places in Vietnam and you should definitely try and find the time to visit it. 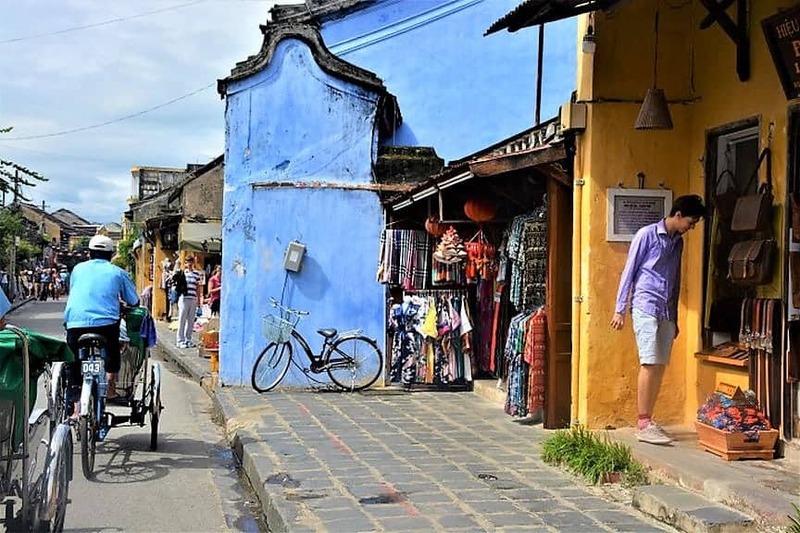 While the majority of Vietnamese cities are full of noisy scooters, Hoi An is a heaven for people seeking to relax for a few days or in our case months while exploring local food and culture. 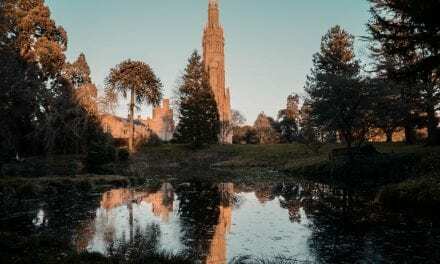 In case you decide to stay longer (weeks or months) in this beautiful town you will have plenty of time to visit nearby areas, towns, and parks as well. 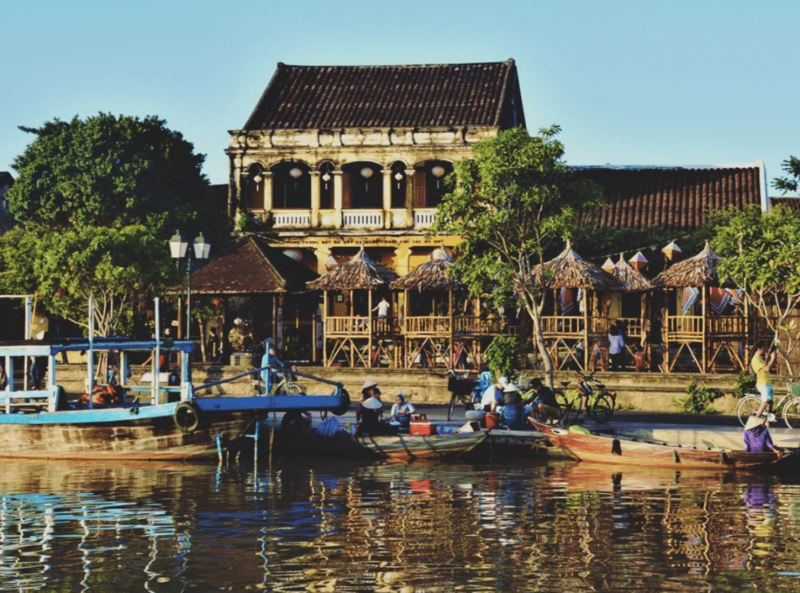 Hoi An conveniently located in the middle of Vietnam and it’s easy to visit places both the North and the South side of the country. The ancient buildings lit by lanterns during the night are just like in a fairy-tale. Not only after sunset but before and during the day this city is just a beauty. Street musicians playing traditional Vietnamese music just top the great experience of this city. 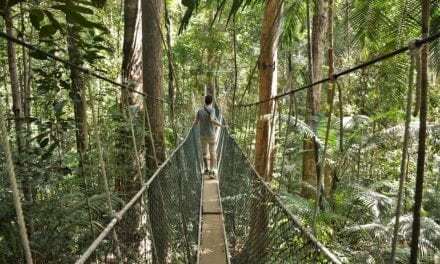 You will easily find many things to visit and activities to do. 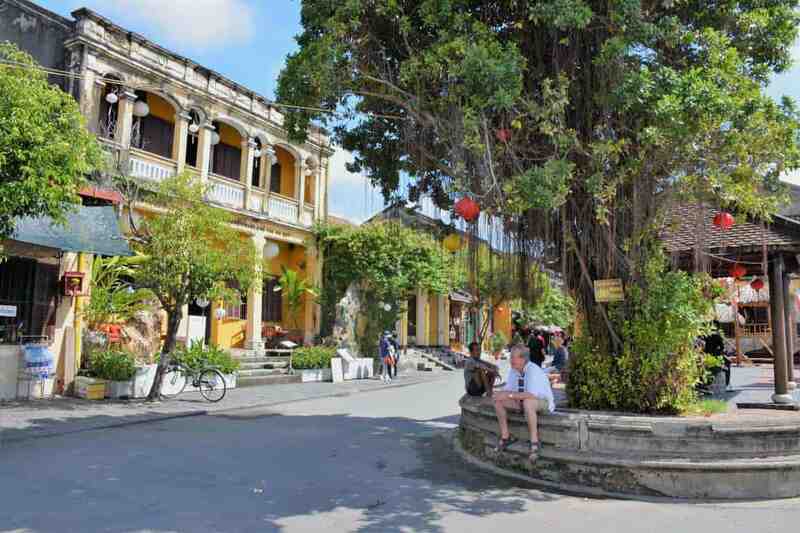 After you enter the ancient town area in Hoi An there will be a lot more to enjoy and discover. The small temples, altars, restaurants and beautiful museums will make your walks around the town a real treat. It costs VND 120000 ($6-7) (2017) to buy a ticket which allows you to enter the ancient town as many times as you wish. 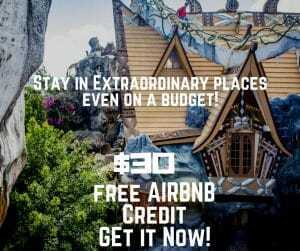 With no expiration date and including five different sights of your choice to visit. We loved the Museum of Folk Culture. The old town is a UNESCO World Heritage Site and the town’s trading port dates back to the 15th century. 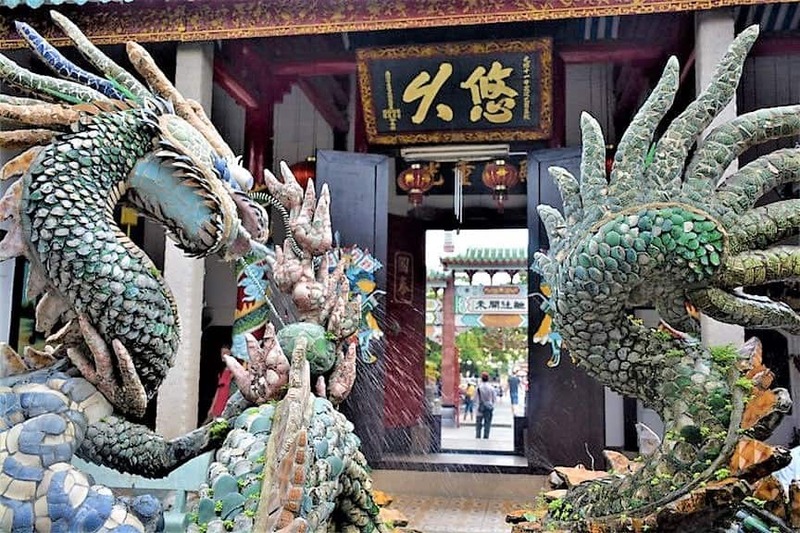 My favorite statue was the Dragon fountain at the back of the Cantonese Assembly Hall (Quảng Triệu). 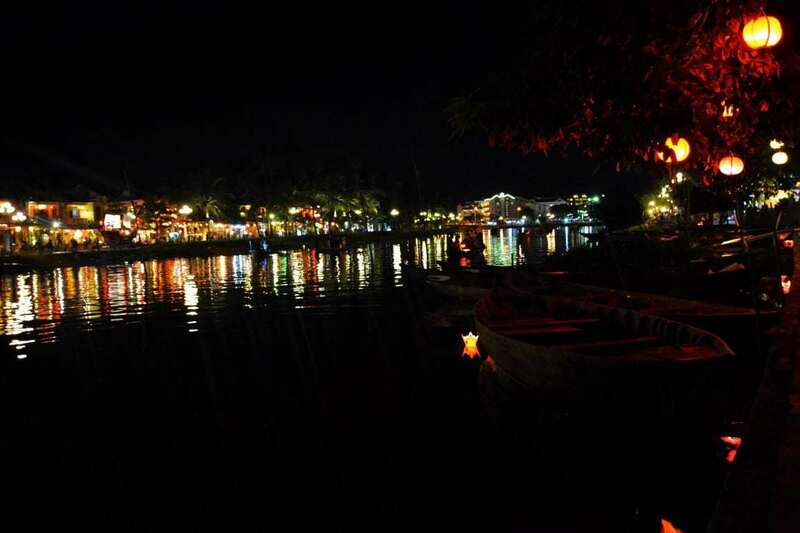 The Thu Bồn River gives you a great opportunity to discover Hoi An on water. 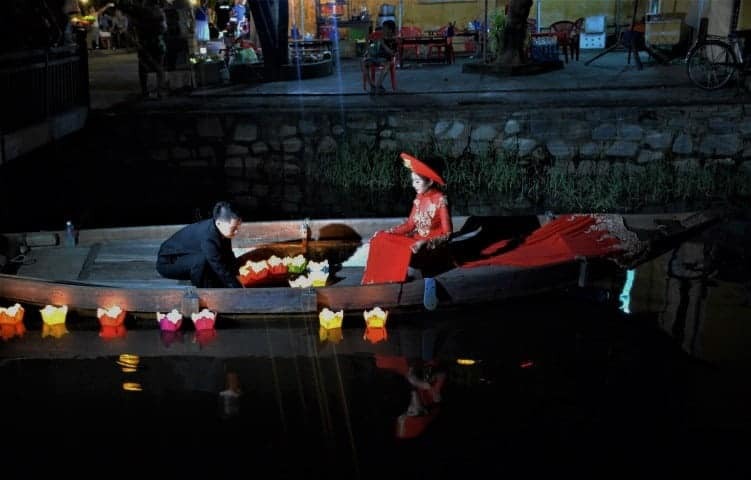 You can simply hop on one of the boats that take tourists around or even rent costumes and release lanterns during the night time for luck and long lasting love. Don’t miss out on the many beautiful restaurants located on the riverfront either. Try out not just the restaurants but the street food as well. 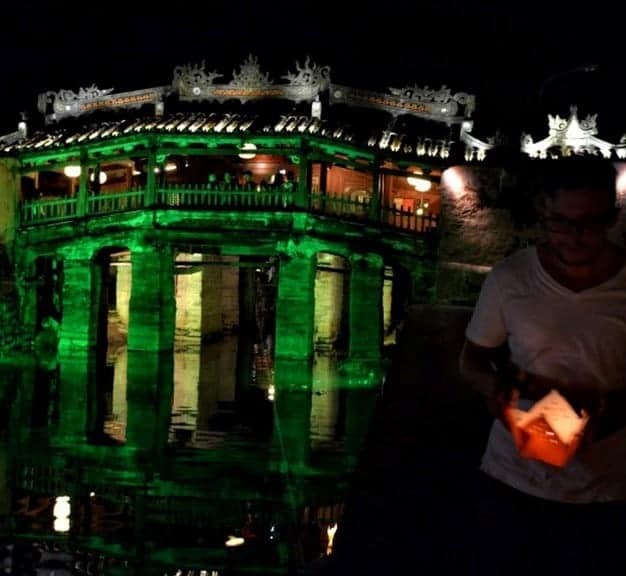 Get a little local experience by having some Pho noodle soup, sit on a chair, and just soak in Hoi An’s night magic. Grab a cool drink and enjoy your time to the fullest. Moments like these are perfect to grab a good book maybe some poetry and spare some time to think. We have a couple of great tips on famous poems you could read. Poems about life, desires, and resilience are perfect to give you some perspective on the journey and experience you’re going through. Check out my favorite post on best poetry books to read when you’re feeling down or emotional and let me know what are your favorites. Hoi An has many of Vietnam’s best spas. 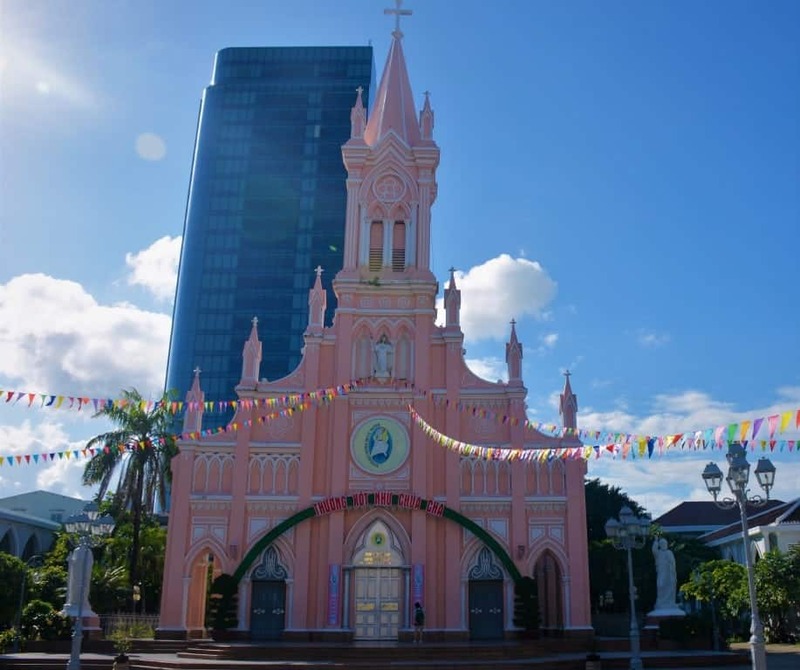 The town is famous for medicine and until this day it’s a city that helps you to unwind and hide away the hustle and bustle of the other more noisy cities in Vietnam. Here you can go to a massage heaven on a budget. Our favorite place was Ginger Spa. This place offers more traditional decor and massage options as well. It’s not in the center so you will have to take a taxi to visit this spa but it’s absolutely worth the extra drive. We had a 3-hour package for $40pp (2017). You will quickly find that you have a new found admiration for these charming lanterns (if you haven’t already). The city is filled with them, different shapes, colors, and textures. 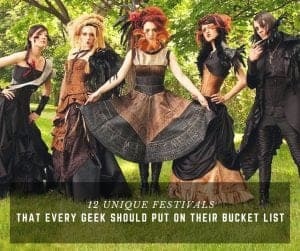 Luckily there are many amazing places around the city where they’ll show you how to make one. 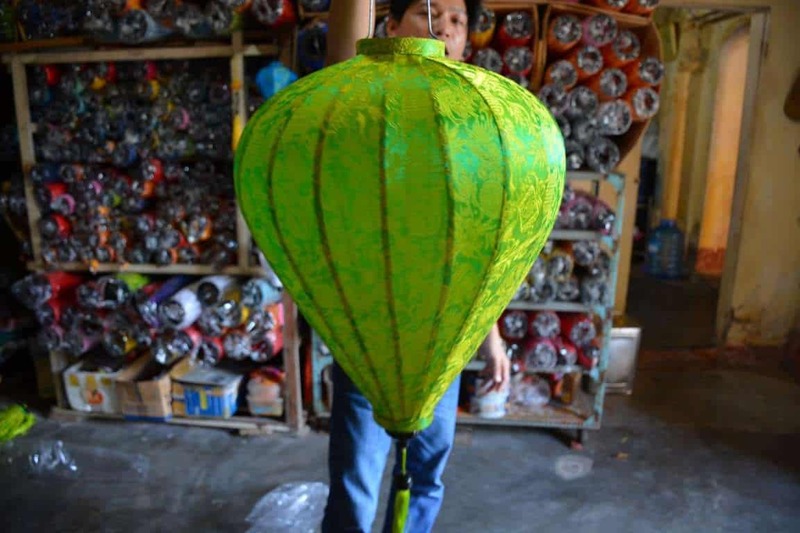 Prices start at $10 including the lantern that you’ll make and can take home with you. You can choose the style, it’s easy to pack in the bags when it’s closed, and it looks beautiful. It’s definitely a nice handmade and traditional gift that you can take home to family and friends. Not to mention they look gorgeous day and night! Or more like an old… Tailor made suits and dresses, 100% silk scarfs, and handmade, tailored leather shoes are waiting for you here. Hordes of tailors can be found who make anything you wish for. The price is negotiable and most dresses start at $15, leather goods, start at $10. If shopping brings joy to you then you’re going to be very happy here! Buying clothes, shoes, and accessories such as real leather valets, bags and belts is the best idea in Vietnam. Also, most of the tailors in the center are much more expensive than the ones on Nguyen Duy Hieu for example. Some sellers can be very “persuasive” even aggressive for my taste. Grabbing your hand and start pulling you into a shop. Don’t be rude but you shouldn’t be afraid of being firm either. A lot is offered for the curious and hungry stomach. In the food market, you find dozens of vendors to try the local food for as little as $1-2 a portion and juices for less than a dollar. There are of course plenty of great restaurants from all around the world. So, don’t worry because Hoi An restaurants have it all. From Italian dishes to fine French cuisine and Mexican tacos, you will find here everything and anything. 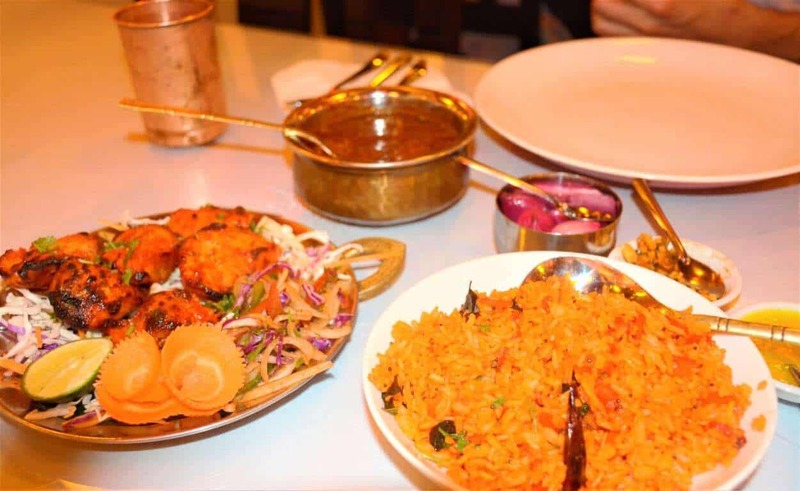 Our favorite find was an Indian restaurant called Ganesh. 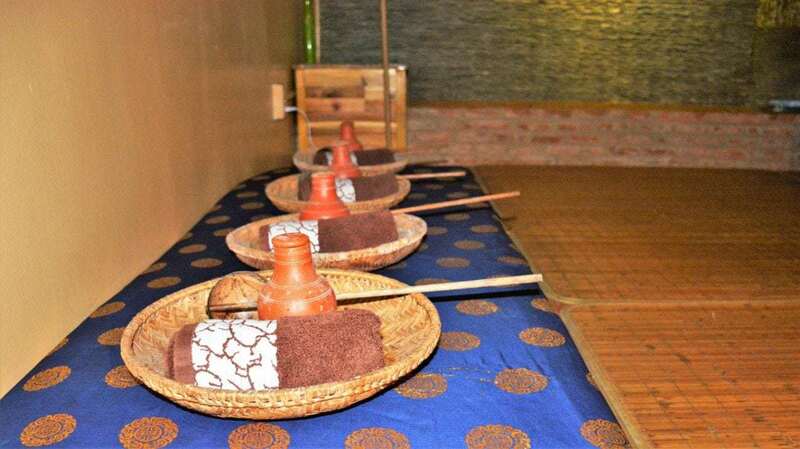 They offer traditional dishes and they taste simply delicious. 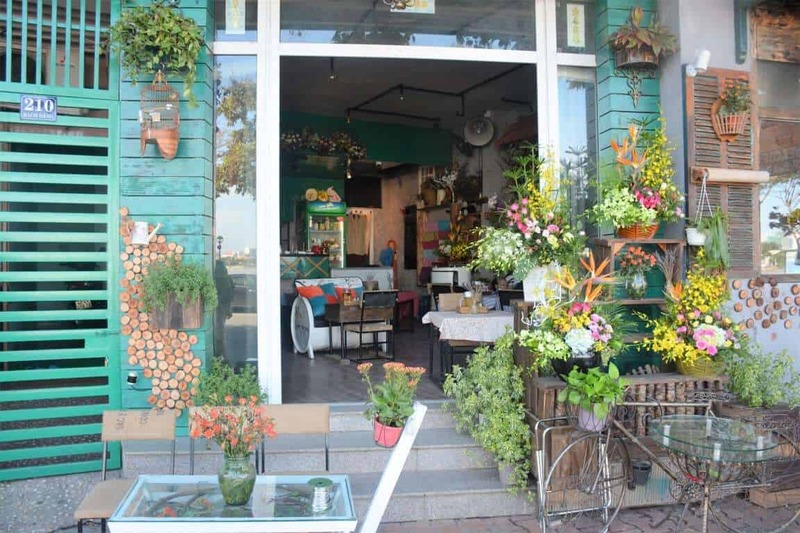 The prices are higher than in an average Vietnamese restaurant but it’s manageable even for those who travel on a budget. 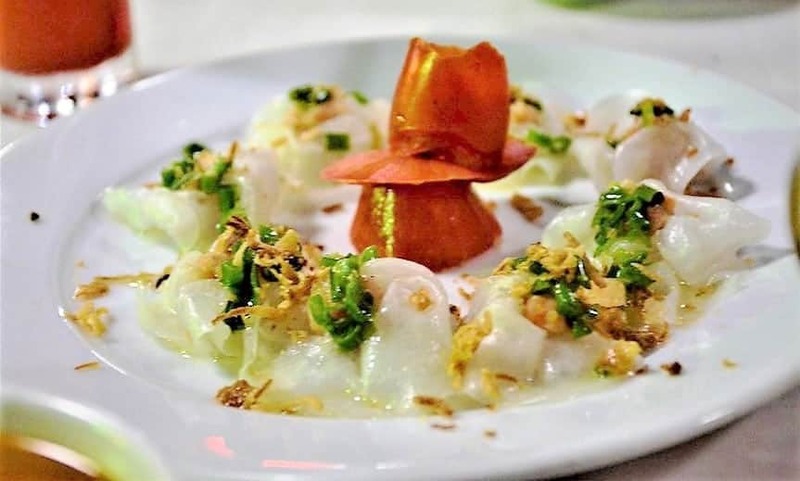 The other thing you shouldn’t miss is “Hoi An’s White Rose” dish (below on the left). 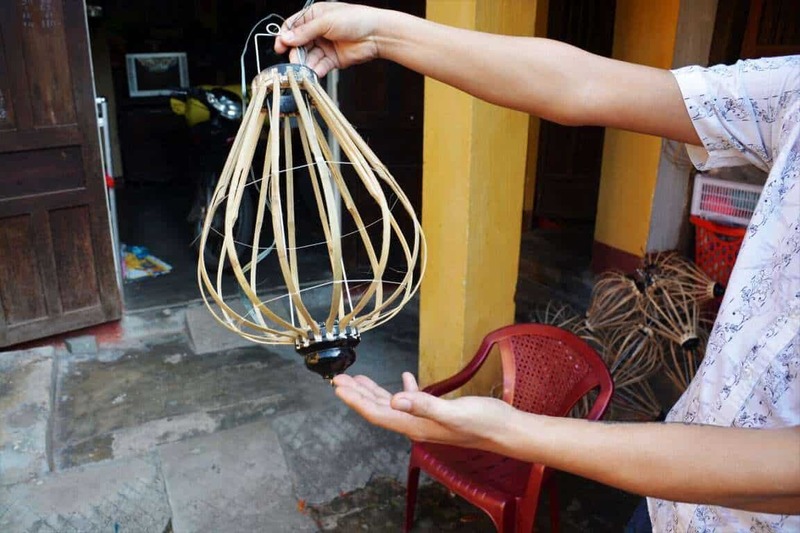 It’s yummy, looks beautiful, and it’s a traditional Hoi An dish. 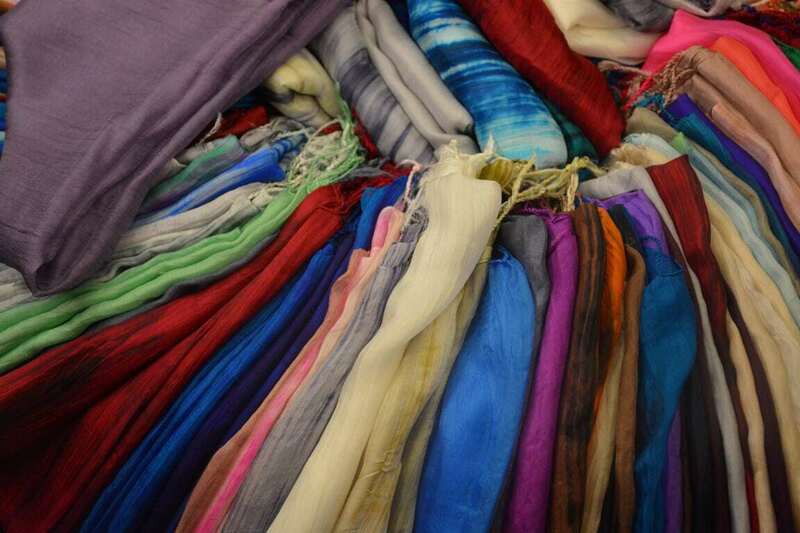 There are multiple markets in Hoi An the most famous and most visited are the Central Market and The Night Market. Both are great places to try some freshly made street food, traditional, and local dishes as well. Keep in mind that some sellers will tell you to take a photo together and then ask for some money. It’s usually $1. I do not have an issue with that. BUT keep small change with you. We only had Vietnamese dong with us at a time and we gave the lady (above on the right) a VND 100K bill. 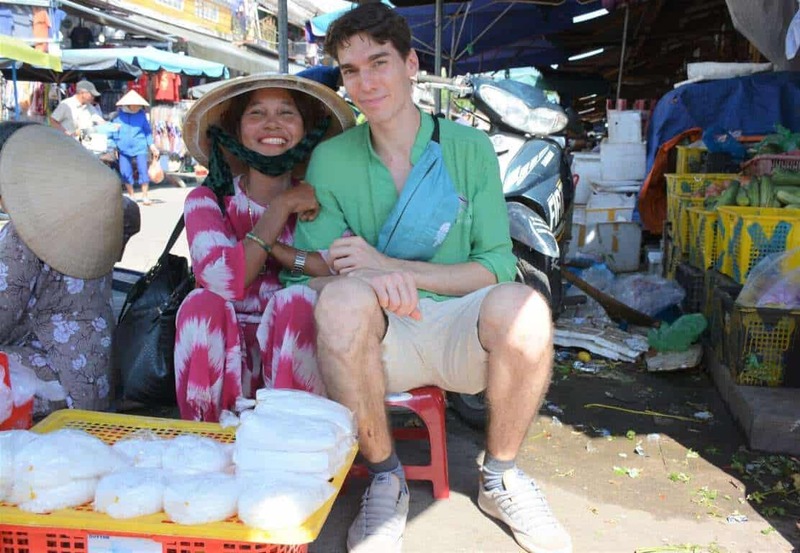 The photo should have cost VND 22K ($1) and she didn’t want to give back the change. Most sellers we encountered were kind, helpful, and plain-dealing but it’s good to keep in mind that if someone asks you to take a photo they will probably ask for a $1 or $2 and if you don’t have change you may have to struggle a bit to get the rest of your money back. Best Banh Mi in Vietnam. Yep, you heard that right. 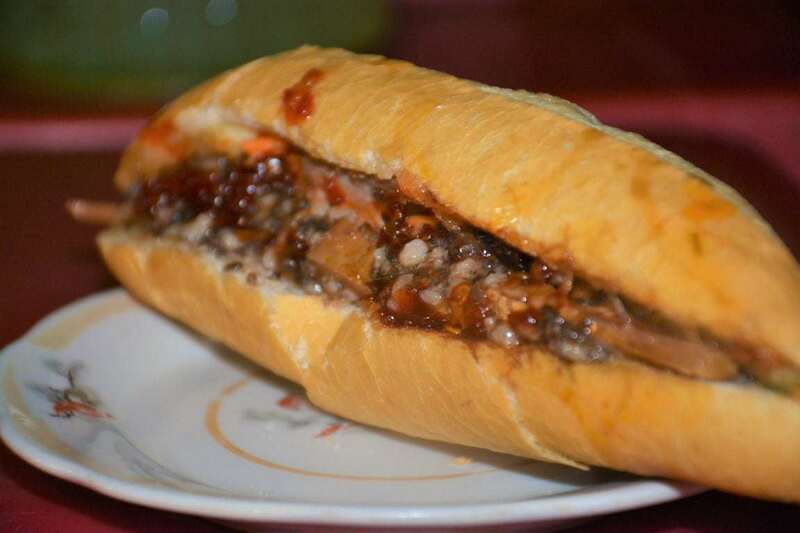 We LOVE Banh Mi and we tried many from North to South Vietnam. 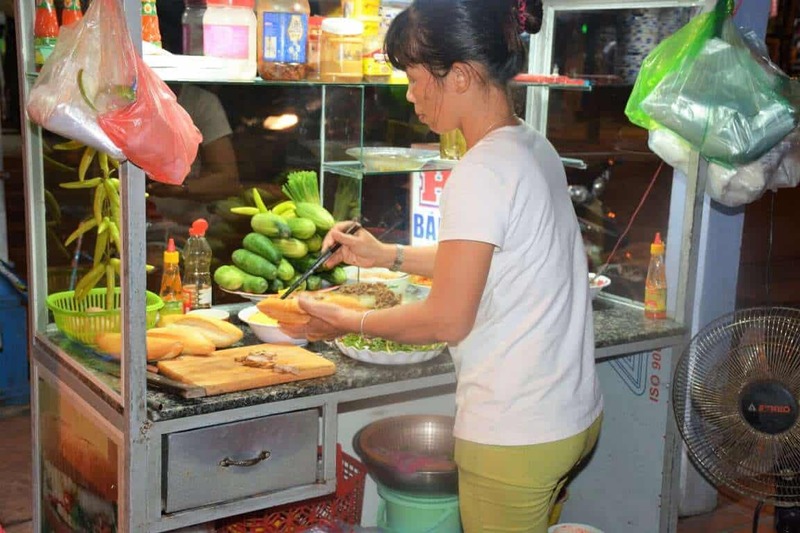 You can find their cart just outside of the center (10 mins walk) on 346 Cua Dai road called “HA Banh Mi”. One Banh Mi costs $0.90 (20K VND). Most people we meet ask us how can they have a more authentic travel experience. It’s easy; live like a local. Try that street food or small local restaurant and don’t just take the photo. Sit down and smile, try to speak with locals. Most of them speak at least basic English especially if they’re under 30 years old. 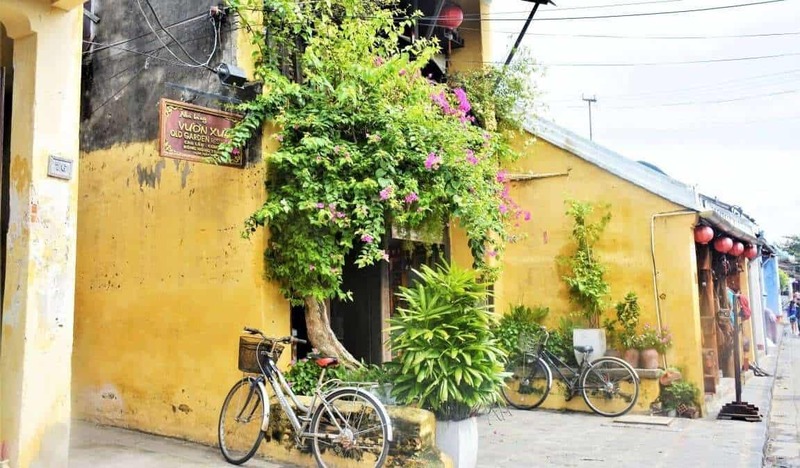 Hoi An is probably the best town to enjoy and learn more about Vietnamese culture. You’re not rushed and it surrounds you no matter where you go. Take your time and don’t just rush from place to place from one restaurant to another museum. 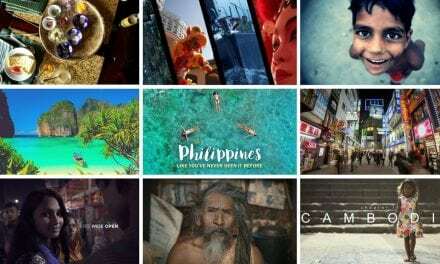 Yes, there is so much to see but you will get a more authentic experience and a deeper understanding of the culture if you take a deep breath and slow down a little. 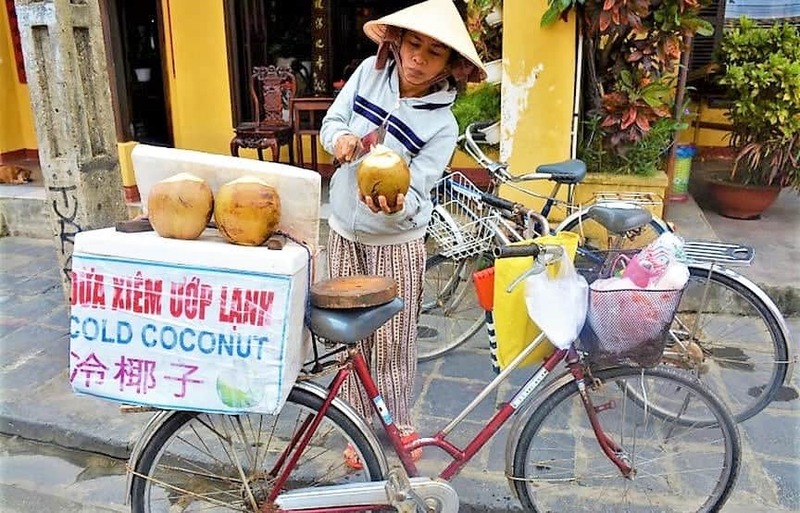 Hoi An is also a perfect place to enjoy some quality biking as well. Other cities are way too busy and sometimes it’s even hard to cross a road on foot so it can be a scary thought for some to hop on a bike. However, in Hoi An most locals choose bikes over scooters. There are many streets where cars are not even allowed which makes this city a perfect place to bike alone or with family and friends. 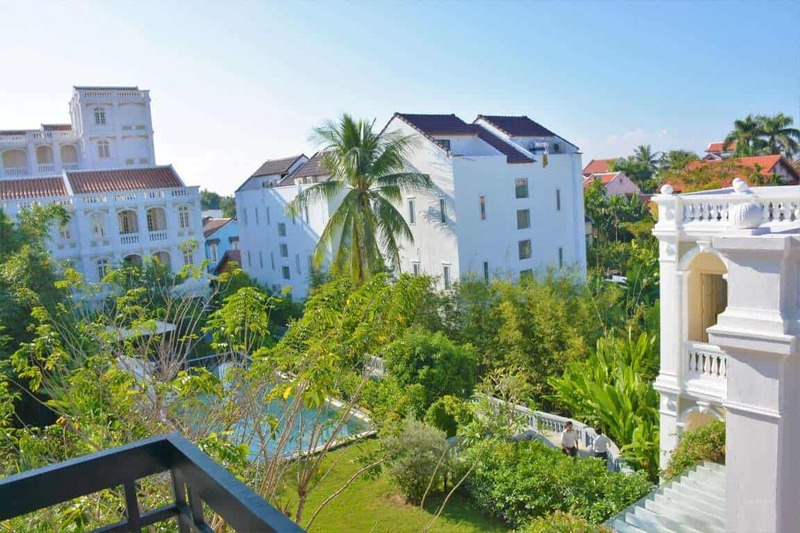 Our favorite is Botanic Garden Villas which is quite affordable. It’s a nice hotel with two pools, private or dorm rooms. 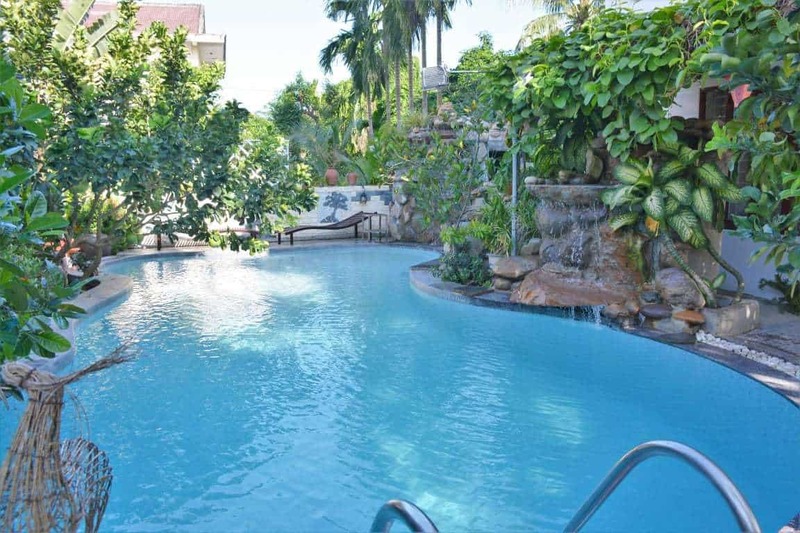 Great offers can be found for as low as $17/night for two in an ensuite double room with balcony and breakfast. 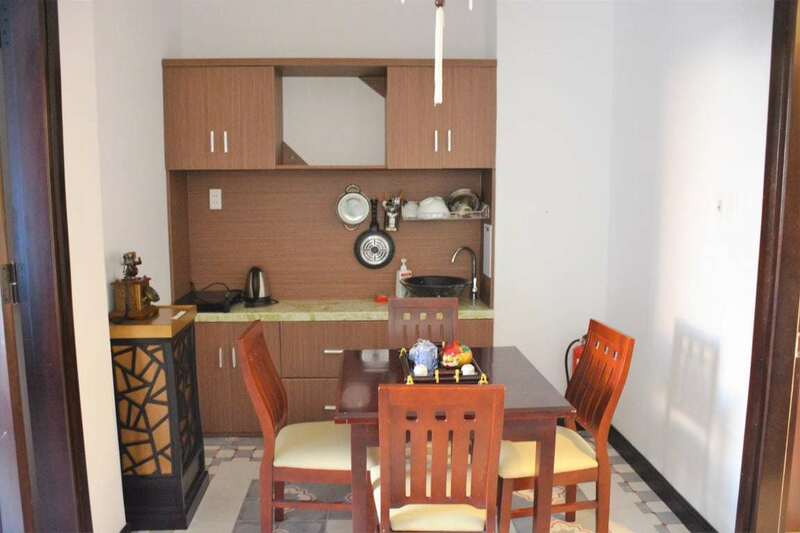 A well-equipped kitchen also comes with the room. It’s a beautiful hotel I only had more fan in a resort in Khao Yai (Thailand) but that one is a magical Hobbit-themed paradise so it’s understandable. 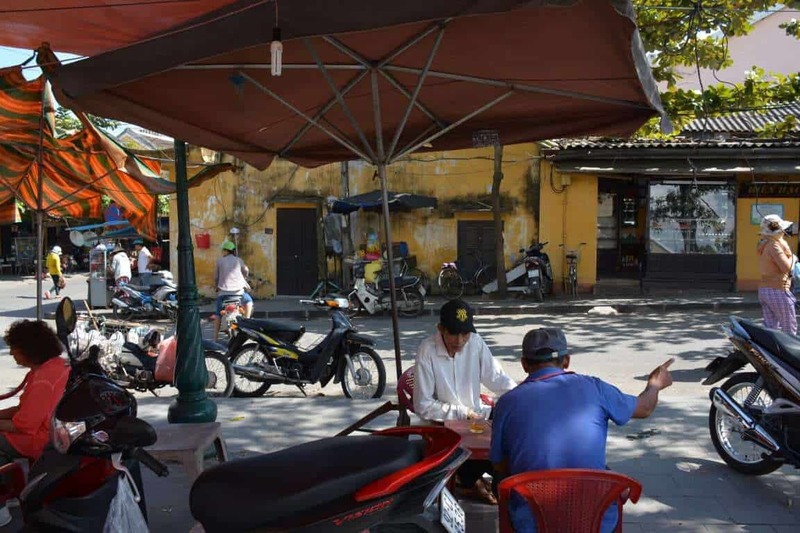 The area is safe (Although, Hoi An is an all-around safe city. ), more locals than tourists and it’s only a 10 mins walk from the center. There are plenty of local and international restaurants, markets and street food around. 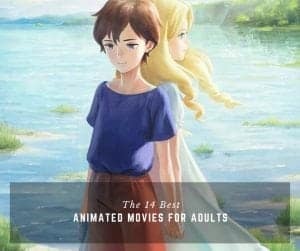 Having a nice hotel room can come handy on rainy days when you just chill and watch your favorite anime shows or looking for the best animated movies you’ve haven’t seen yet. 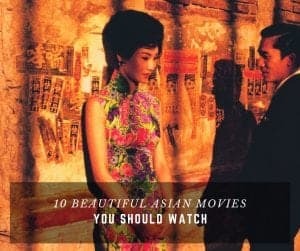 We have some great recommendations on what Asian movies you should see to understand more about this wondrous continent. 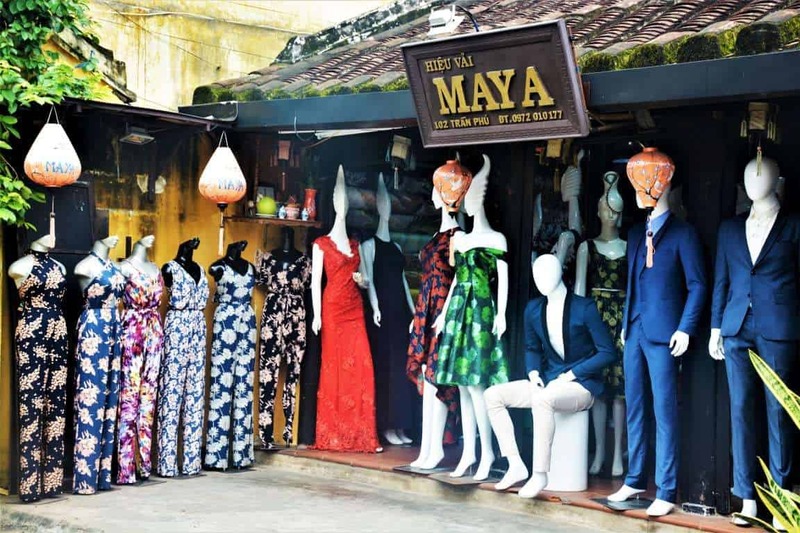 How to get to Hoi An & when is the best time to visit? 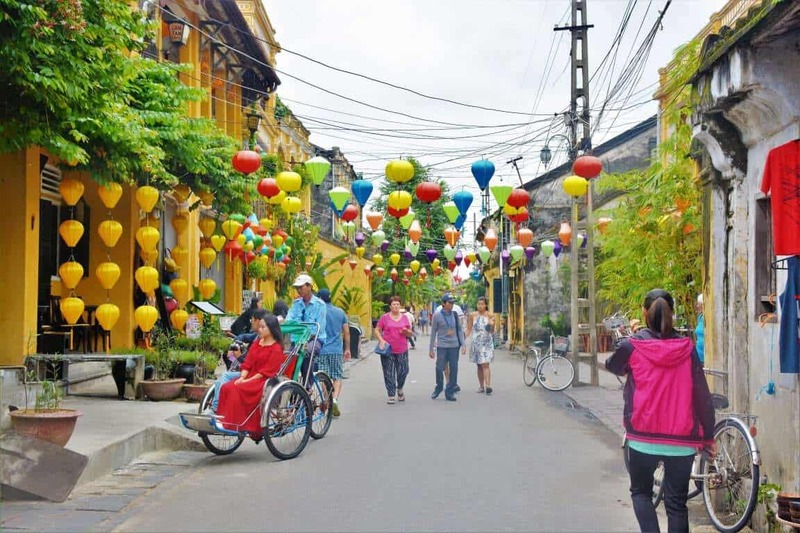 It’s easy to travel to Hoi An both from Hanoi and Ho Chi Minh City. 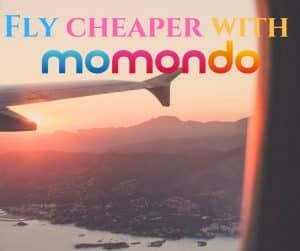 You can go by bus for about $5, train $8, or take a flight for about $20. 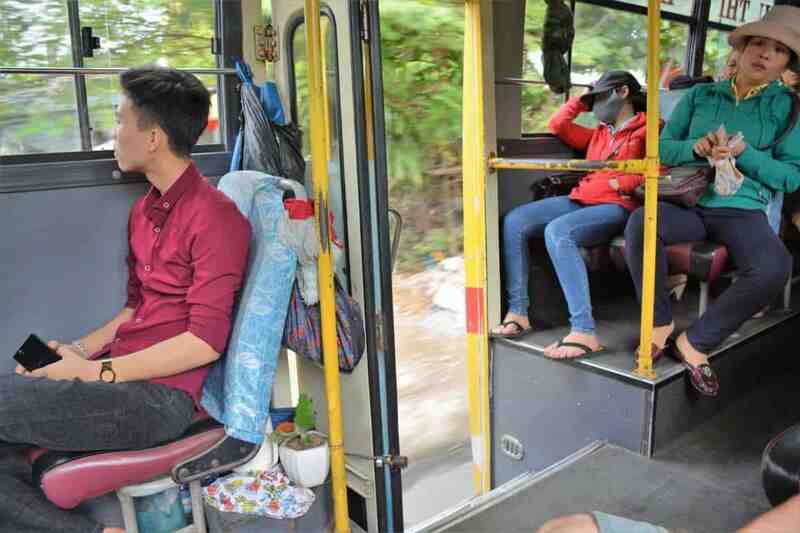 Keep in mind that it can take more than 15 hours from Hanoi to Hoi An to arrive if you go with a bus or a train. From Ho Chi Minh City to Hoi An will take about 19 hours. 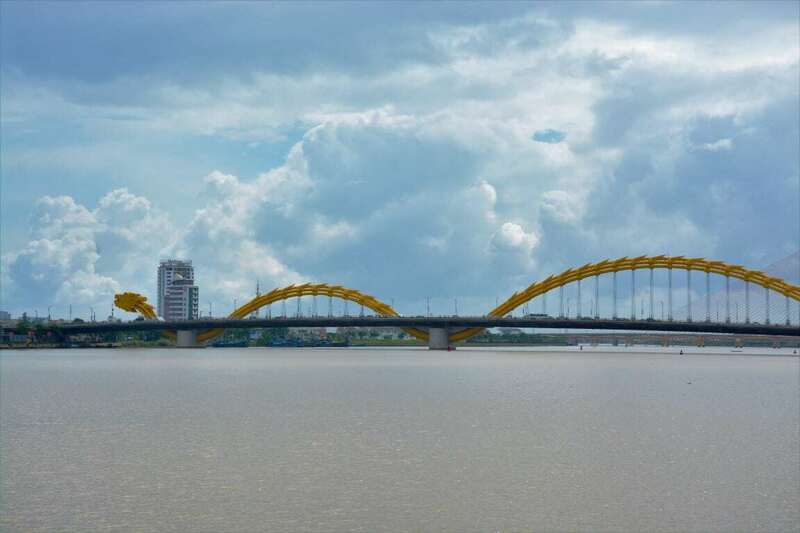 While a flight only takes (both from Hanoi & HCMC) 1h 20m, you will arrive at Da Nang. You can take a bus ($1) or a taxi ($12) to Hoi An that will be another 30 mins. The dry season is from February until July with lots of sunshine and warm weather. If you visit between February & April the weather will be cooler and with an acceptable amount of rainfall. 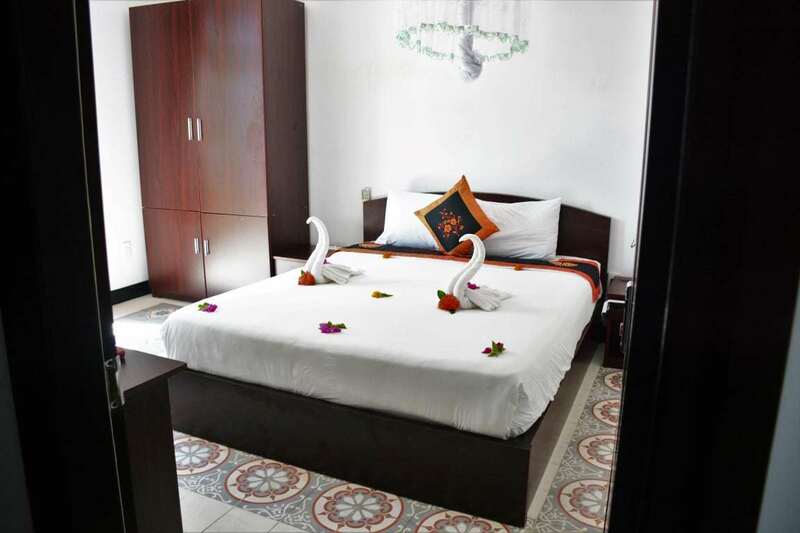 What else can you do near to Hoi An? 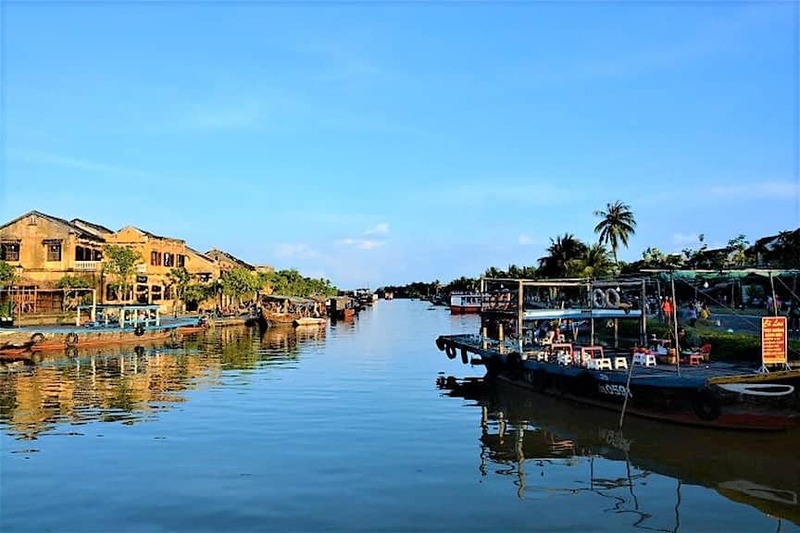 Hoi An is a great city with access to Da Nang (getting there is either $12 by taxi or $1 by bus, but do not let yourself rip off by the “ticket conductor” on the bus, who might want to charge you for $12! ), Cham Island and My Son (tours can be arranged from almost every hotel). 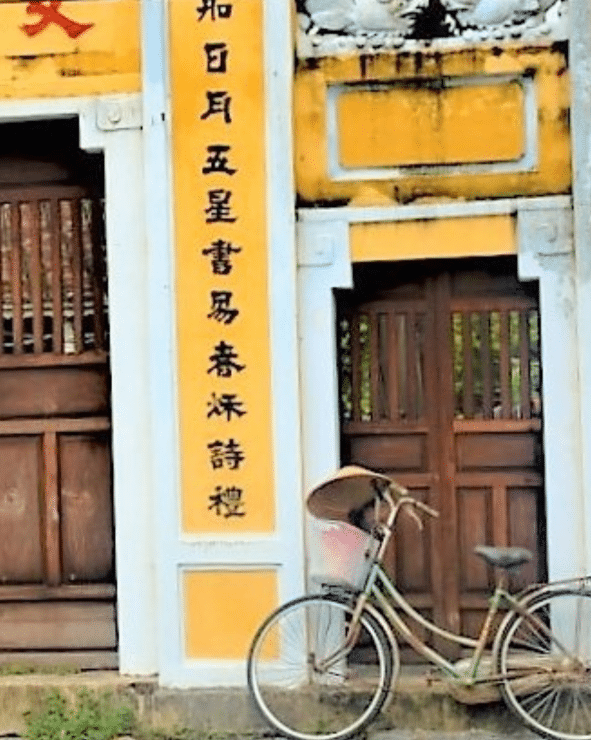 The ancient town of Hue is also close. You can take a bus, train (It’s about a 3-hour drive) or a 1 or 2 days tour.